Love data visualization? Love pies? So do I. 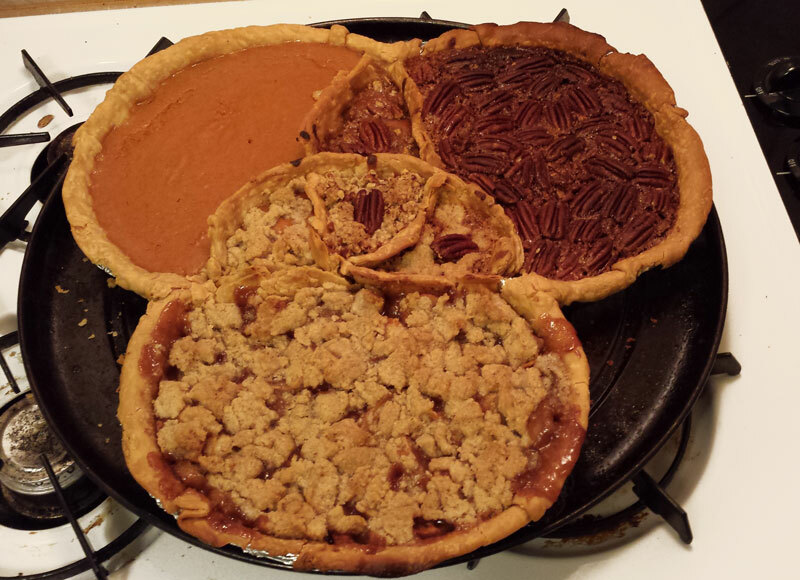 Last Tuesday we had a Thanksgiving potluck at work, and at the instigation of a coworker I made a Venn diagram pie. Here’s how I did it, if you want to try it yourself. You can use whatever flavors you want, but remember they have to combine into a pleasing flavor profile. The flavors of the three ingredients I used were pumpkin, pecan, and apple crumble. The recipes were fairly straightforward. Since the undertaking was complex I went simple with the recipes. For pumpkin and pecan filling I adapted About.com’s Southern Food Classic Pumpkin Pecan Pie recipe. For the pumpkin filling I bumped up the ginger and added nutmeg. For the pecan filling I used dark corn syrup, replacing about 1/3 of the dark syrup with maple syrup and a little molasses. For the apple pie I used Cortland, Gala, and Honey Crisp apples. (I recommend The Apple Works for good information on what apples work best in what contexts.) Once again the About.com Southern Food section provided a good Apple Crumble Pie recipe. I’d never used it before, but Pillsbury’s rolled up pie crust did pretty well! Two sets of aluminum cake or pie pans (4-6 pans). Cake may allow you to overlap the three pans and the middle section more easily, but pie works, too. You’ll need three pans for baking, and at least one extra to make the middle crust. 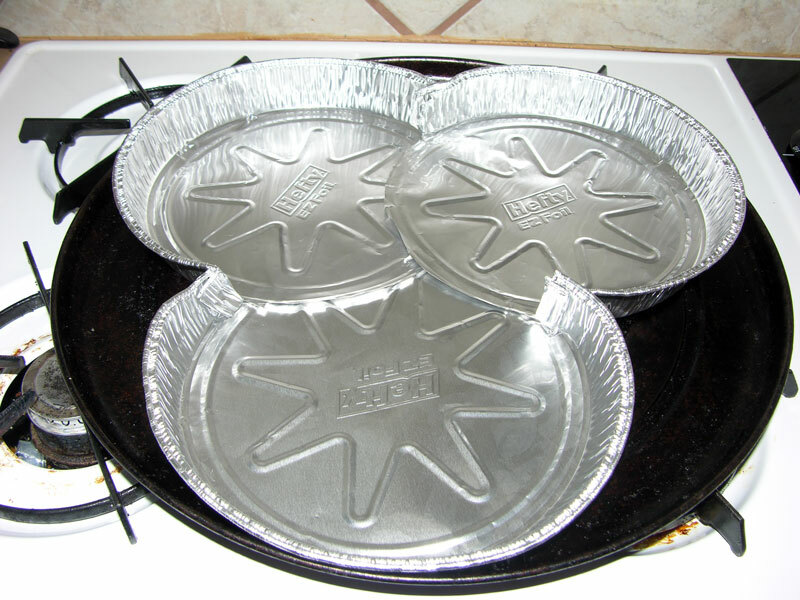 Aluminum foil to cover the pie plates and prevent leaks. You’ll also need it to protect the crust while baking. Enough pie crust for the bottom of four pies. 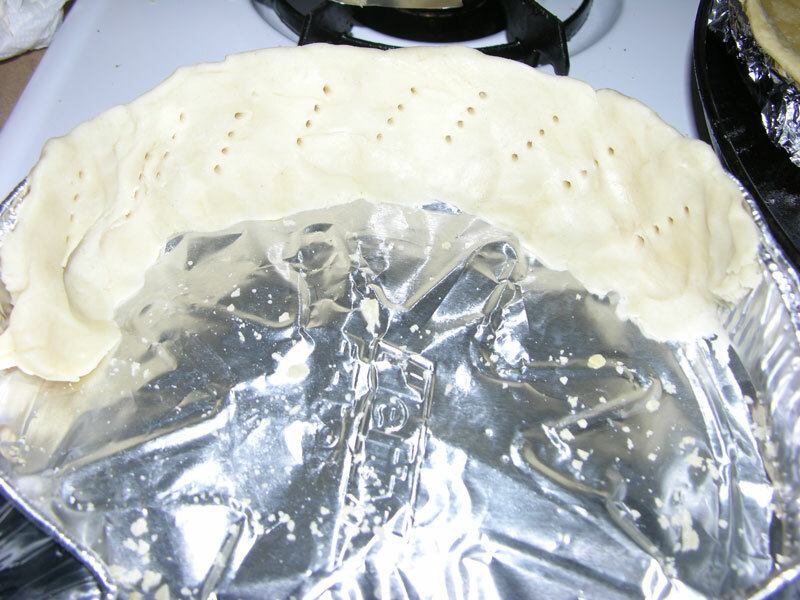 This will cover the three-plate section, provide crust for the middle, a base to hold the middle pie crust in place, and a little extra in case you want to add decorations. Pumpkin pie filling to taste. Pecan pie filling to taste. Apple pie filling to taste. Crumble mix (no pecans to start). Pecan halves for topping and to add to crumble mid-way. A cookie sheet to support the pie plates, which will not be structurally sound enough to support the weight of the pie. Two six-packs of graham crust mini-pies (for excess filling). Here’s how the three pans overlapped. Note how corners are folded over. I used an ancient pizza pan for support instead of a cookie sheet (most cookie sheets don’t fit in our tiny oven). 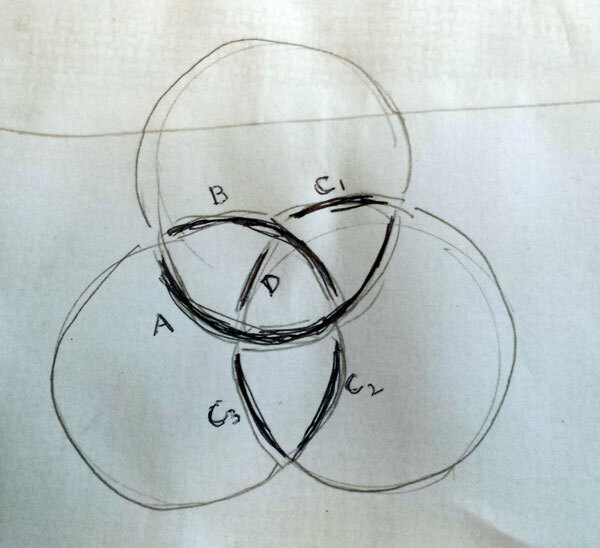 Making the superset framework for a Venn pie-agram. A detail from the bottom. Cut your flattened sides into sections so they lie flat and don’t warp your pan. Detail, cut and overlapping sides. 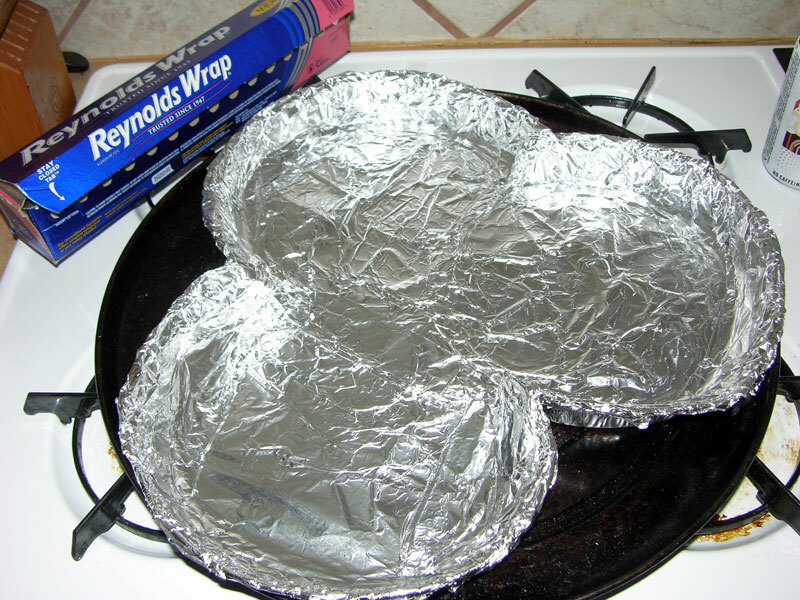 Line your completed pan with aluminum foil to cover the sharp edges you’ve cut and prevent leaks. Any experience with tin foil hats helps in this step. Unroll your pie crust and lay it out. Cut away excess and press edges together so you have a continuous bottom that isn’t too thick. Keep your excess pie dough! The image below, with raw dough and supporting aluminum, does not work. The crust melts and doesn’t hold its shape. Thin metal dividers also do not work: they leak abominably. 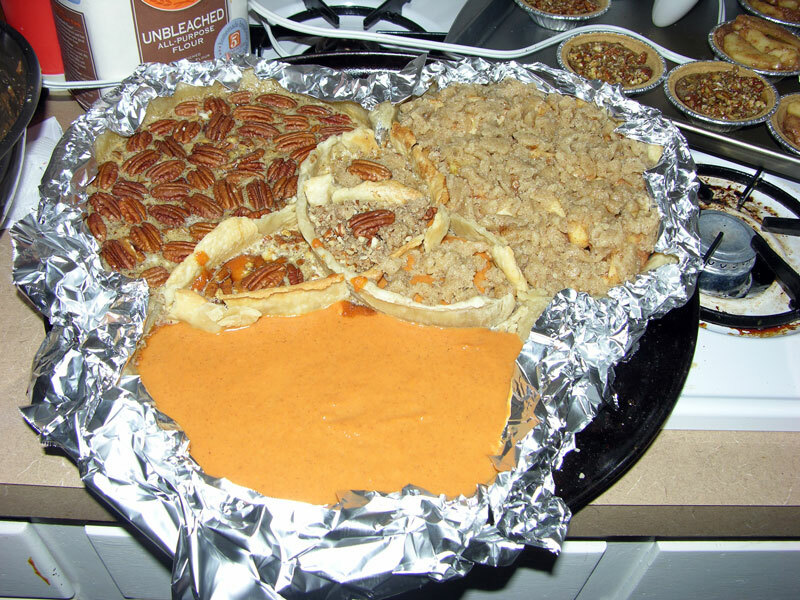 I learned this making my first “pie chart” pie; metal dividers were much more trouble than the crust below (for one thing, I had to tilt the pie in the oven until the pecan filling set). 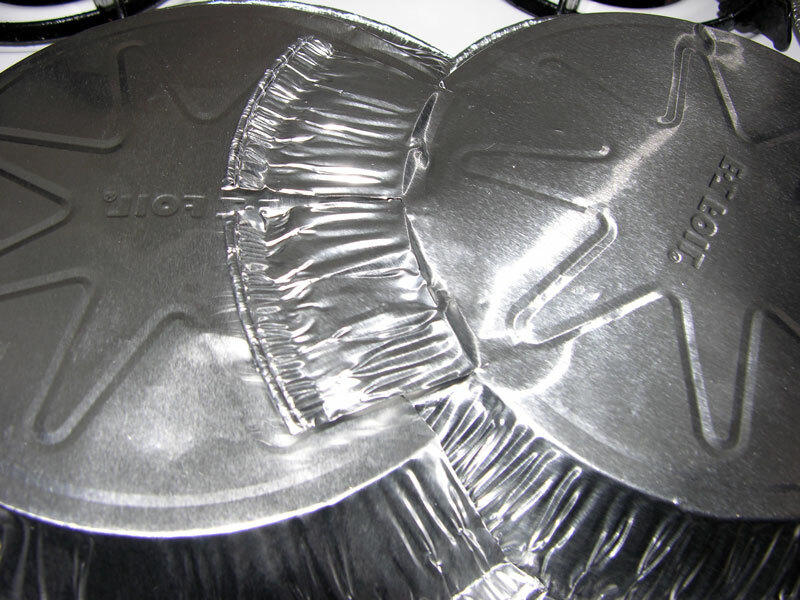 Little metal dividers not only leak, but the necessity of removing them before eating would ruin the pie. 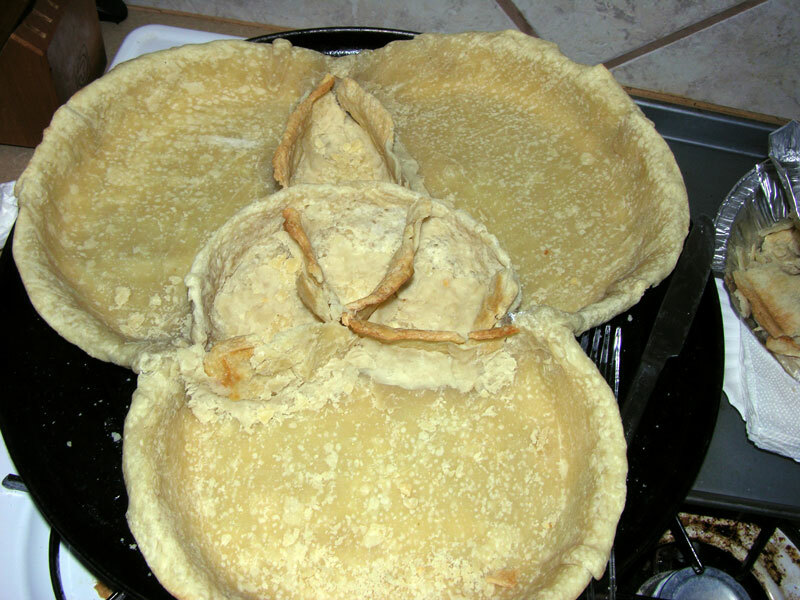 Partially bake your pie crust edges and bottom about 10 minutes at 350°. Also bake sections for the middle crust, separately (see below). Note that the middle crust has a slightly tighter curve, to make the overlapping areas slightly egg-shaped instead of pure circles. This will give you more space in the middle sections. Don’t forget to puncture the crust with a fork to avoid bubbles! Important: reserve extra unbaked pie crust. You’ll need it to make the middle section work properly. This piece will form part of the crust defining the overlapping sets in our Venn pie-agram. 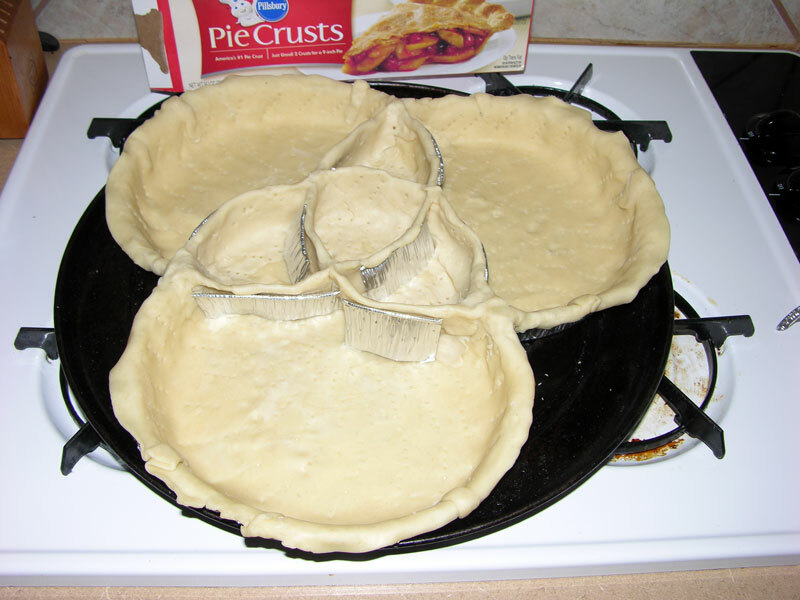 These are the crust pieces you’ll need to shape the middle of your Venn pie-agram. I used six crust lengths: one long curve, one not-so-long, three short ones, and one tiny one. Super-sophisticated Venn pie-agram wire frame. 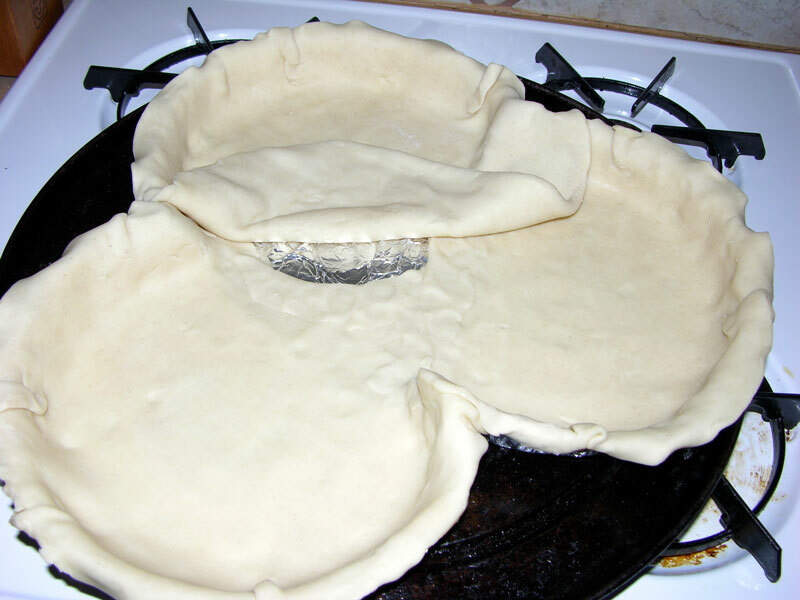 To make the crust stay in place and reduce leaks, use unbaked dough to hold the partly-baked middle sections in place. It doesn’t need to be perfect. Tip: Use a bread knife to gently saw the pie crust sections. Pie crust is crumbly. Try to make them line up naturally with the outside edge. This is what your middle should look like. It’s not perfect circles, but trust me, you’ll prefer this when creating your overlapping fillings. Tip: Start with the firmest filling first. It will fill up any weak spots a more liquid filling might break through, keeping your sections more compartmentalized. 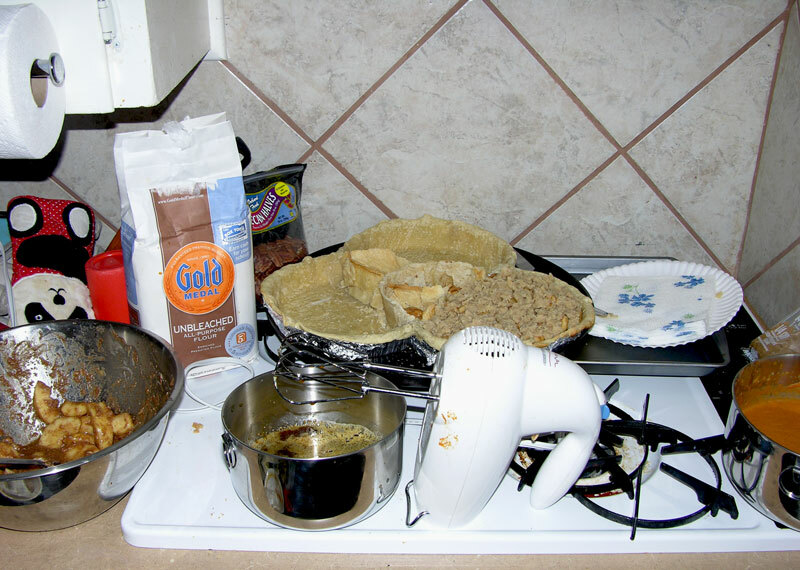 Here, the apple pie section has been filled and covered with crumble; apple has been layered in the bottom of its three overlapping sections in the middle. To the right, pumpkin filling (my next step). The pecan filling is in the center; pecans have yet to be added. I used crumbled pecans for a thicker mixture. Pecan filling went in last. Ready to bake! Note the aluminum foil protecting the edges from over-baking. 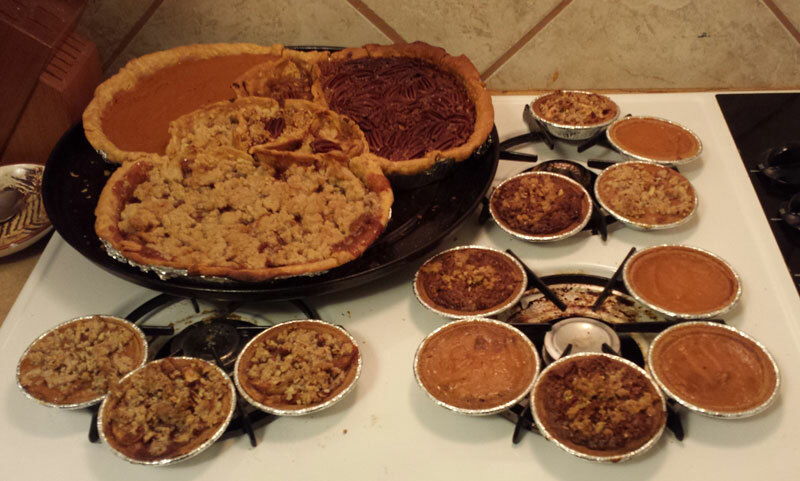 You can see some of the mini-pies I made using the excess filling. On its way into the oven! The pie baked about an hour before a knife came out cleanly from the pumpkin filling. The mini pies, which I baked after the pie, took about 35 minutes without a cookie sheet. Oven heats vary, so check your pie at around 45 minutes, and your mini-pies at 25 minutes. A Venn pie-agram triumph! Or, the mother ship and her fleet. Whichever you prefer.